I finished this up last week..got it blocked yesterday..took pics today..moving head...I made this with a color that has been discontinued #619 if you want to look it up on DMC chart. It is darker than cream, but lighter than tan...I love this color..I don't know why they stopped making it. The pattern is from an old time crochet magazine, but I think you can find the pattern for free at one of those sites that have the free patterns..mom's love of crochet..going to be listing it in my shop..I think.. Isn't this just a beautiful pattern? Girl you do awesome work, I love it! Gorgeous doily. Your work is superb and so neat. Hope you are feeling better now. Have a nice day. I have never experienced vertigo but I hope you are doing better. 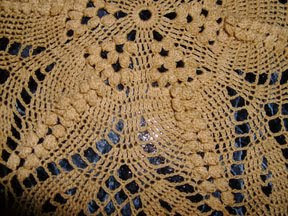 Beautiful crochet! I have had vertigo when I was traveling on one of my trips to Maine. Had to go to ER. Round and round upside down. So not fun but meds prescribed helped me pretty quickly. As usual your work is awesome! You poor thing, vertigo is no fun. It is hard to not move your head. Hope you feel much better soon. Love your latest fantastic creation. That would be a problem...not moving your head while you're driving. Hope you're doing better! Gorgeous doily, as always! DMC Cebelia Crochet Cotton Thread on Sale!! Grrr, argh, and proof that I have no sense.